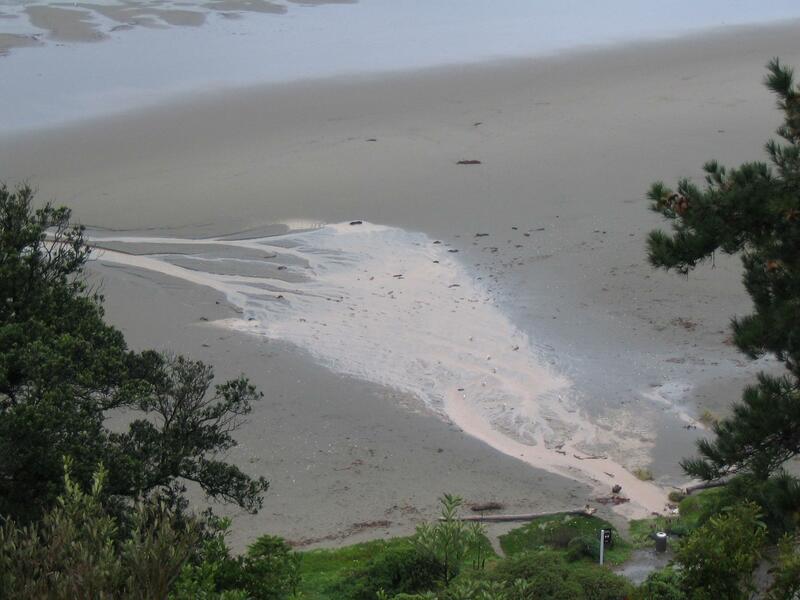 Sediment polluting a Canterbury beach and estuary resulting from poor soil and surface stabilisation. To stabilise a site means to carry out practices that protect exposed soil and therefore prevent the soil from eroding. When a site is ‘stabilised’, it resists erosion. These practices can work as either temporary or permanent measures. Some can be used for instant results (eg geotextiles, aggregate, mulch), whereas others – like grassing – take longer to protect the area. Many of these practices can also be used and combined to stop dust from being generated. The presence of vegetation reduces runoff and can mean that you don’t have to do as many structural stabilisation practices. So if there is existing vegetation on site, keep as much of it as possible. If you are adding vegetation, the surface is considered stabilised once 80% vegetative cover has been established over the entire revegetated area. Although not covered in this guide, you may also need to consider wider and more permanent geotechnical stabilisation for your project beyond the earthworking phase. Each practice is described for all stages of the project’s design, construction, operation and maintenance.